Tired of having to keep a constant eye on your shoulders for flakes? Dandruff (also known as seborrhoeic dermatitis) is the most common hair and scalp issue around with over 70% of the population suffering from it at some stage during their lives. It is made up almost entirely of dead skin cells that have come loose due to the dry, dehydrated conditions of the scalp. When our scalp is dry, our bodies produce more sebum to compensate. This is an oil that our body produces naturally and in the correct amounts helps to keep our skin soft and supple. However, when produced in excess dead skin cells and excess oil plug hair follicles leading to bacterial and fungal infection. Sometimes the area can even become red and itchy. Regularly massaging the scalp with natural oils is well known to improve blood circulation as well as provide the nutrients required to hydrate and nourish the skin and one of the best natural oils in the treatment of dandruff is coconut oil. 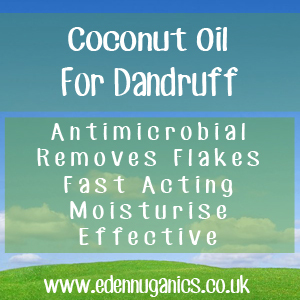 Coconut oil is full of antiviral, antimicrobial and antifungal properties greatly reducing the chances for infection of the skin during dandruff break-outs. Best of all, it's natural so it has no nasty side-effects. At room temperature 100% pure coconut oil forms a hard white waxy consistency which needs to be melted or warmed between the hands before use. Happily coconut oil melts in seconds once in contact with the warmth of the body. Once warmed, pure oil should be applied gently over the scalp using the tips of your fingers to massage it into the skin. Once covered wrap your hair in a towel for around 10 - 15 minutes before washing it off thoroughly with warm water and a good, natural shampoo (something mild without harsh chemicals that will undo all your good work). This deeply nourishing moisture therapy for dandruff can be repeated up to four times a week. Apple Cider Vinegar - Apple cider vinegar is not only a powerful anti dandruff treatment, but also extremely popular as part of nopoo (no shampoo) beauty routines. The naturally occurring acids help to strip unwanted product build-up from your hair and leave it looking lush, soft and shiny. The best way to use ACV is to make a 50 - 50 blend of water to vinegar and rinse your hair with this daily until symptoms improve. Baking soda - Baking soda is another great remedy for this flaky, somewhat embarrassing condition. It helps to remove dandruff in a number of ways. First, it has a mild exfoliant action which gets rid of excess dead skin. It also has antifungal properties that fight common fungal invaders that occur on everyone's scalp and contribute to the build up of dandruff.